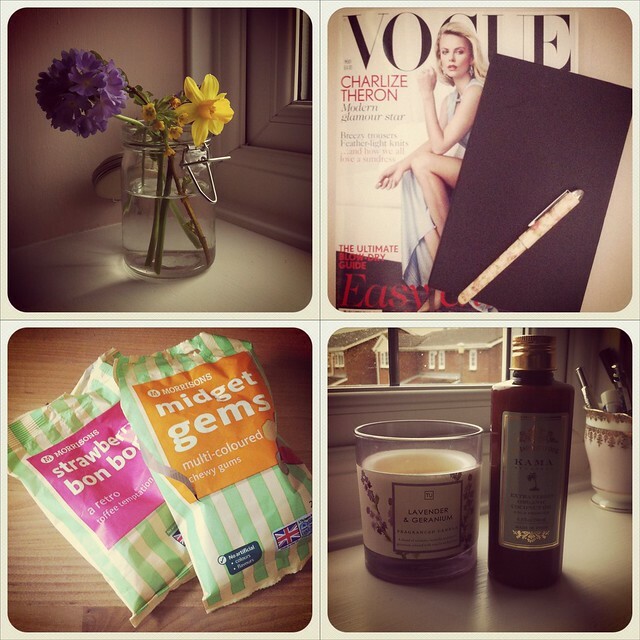 Just a few things that have been brightening up my day: pretty flowers to cheer up miserable days, new Vogue and a new moleskine, retro sweets, lavender scented candles and coconut hair oil from Kama Ayurveda (bought while in India). I’m looking forward to a pretty quiet weekend and having a bit of time to pamper myself. I tried out the Kama Ayurveda hair oil last week, and not only does it smell gorgeous but it made my hair so silky. I’ve been recommended MoroccanOil by a few people and I want to try that out too. Has anyone used it? As you can see I’m having my blog revamped at the moment. The lovely Fen is designing me a new layout, so if you visit me and the site looks a little strange it may be because it’s still being tweaked. I love everything she’s done so far though and she’s got a brilliant eye for aesthetics. Go visit her blog, you’ll see what I mean. Lovely post. Yes I have used Argan or Moroccan oil as it's most commonly known. It really is worth the hype. Leaves hair soft and silky without the added heaviness that is associated with most hair oils. You should try it.